Consolidation loans: Paid in full! 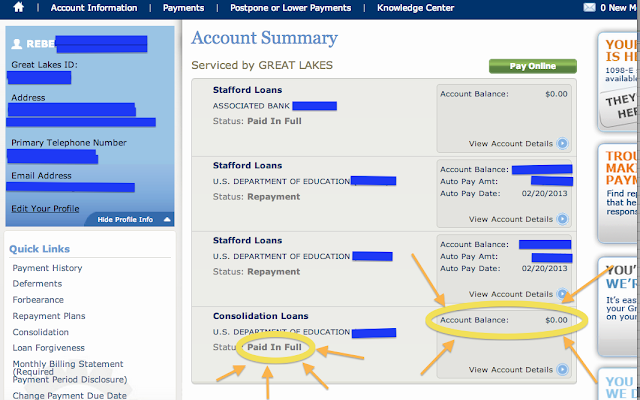 I paid off my consolidation loan yesterday! That's my first loan that I've completely paid off (The stafford loan up top with a $0 balance was one of the ones that got consolidated). That leaves me with three student loans left: my two Stafford loans and the ECSI loan. My weekend job and my federal tax refund helped me pay this first one quicker than I'd originally planned (as did leaving my 1,000 euro / month job in Spain to move back to Wisconsin). While walking to dinner from work earlier this evening, I noticed a bunch of people stopped ahead of us on the sidewalk. My friend said something about a "hawk" and we were stopped too. I thought I misheard, that he had said "hot" something, and then I saw it! Right in front of us next to the sidewalk was a hawk carrying a whole rabbit. It flew a few yards over to this staircase, where said friend was able to snap a quick picture, and then it flew across the street to a church. I've never been that close to a hawk before, let alone a hawk carrying a dead rabbit. Did anything exciting happen during your Wednesday? Cool blog! 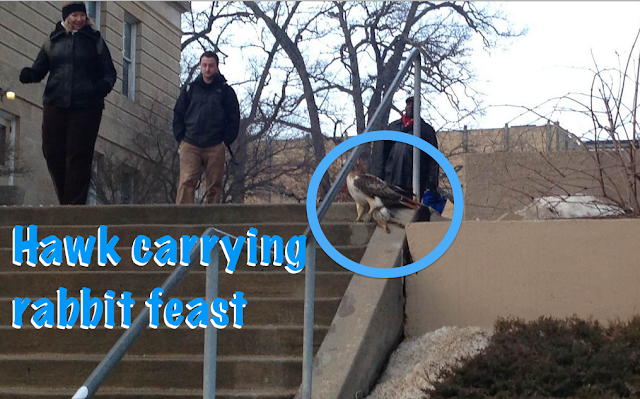 Congrats on paying off your loan and nice hawk sighting! Can't wait to send my postcard. Thanks! Mine are getting sent out in the mail tomorrow morning. Paying off a loan is a BIG DEAL! Congratulations!